Black metal folding chair with heavy tube frame and thick padded seat. Good chair for indoor meetings and events. Delivery, set up and take down services are available for an additional cost, please let us know if you are interested in this service when you place your order. 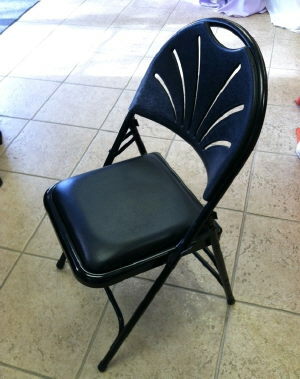 * Please call us for any questions on our padded metal folding chair black in St Petersburg FL, serving Clearwater, Gulfport, Pinellas Park and the Tampa Bay Area.